In case you have captured a lot of amazing family videos with your iPhone X, and would like share them with friends all over the world, but failed to upload iPhone X videos to YouTube. Then how to solve? Don’t worry, we’ll share two positive solution in this article and just read on. 1. Open Photos app and tap on the video to upload. 2. 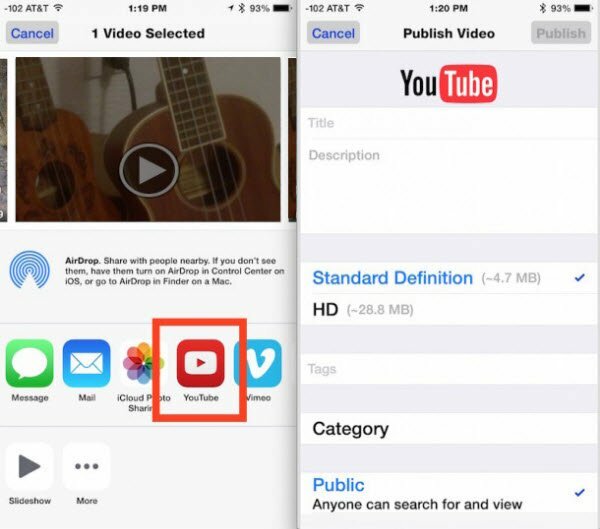 Tap the square arrow share button to bring up sharing options, then tap the “YouTube” icon, you’ll see a “preparing” screen as the video gets ready to upload. 3. Login with the YouTube credentials to the account you want to upload the video to. 4. Provide a title, description, and more info if desired. Editor Note: YouTube now accepts 8 video formats to be uploaded, including MOV, MP4, AVI, WMV, FLV, 3GP, MPEGPS and WebM, supports 8K and 4K resolutions and file size of 2GB. Videos should not be longer than 15 minutes. 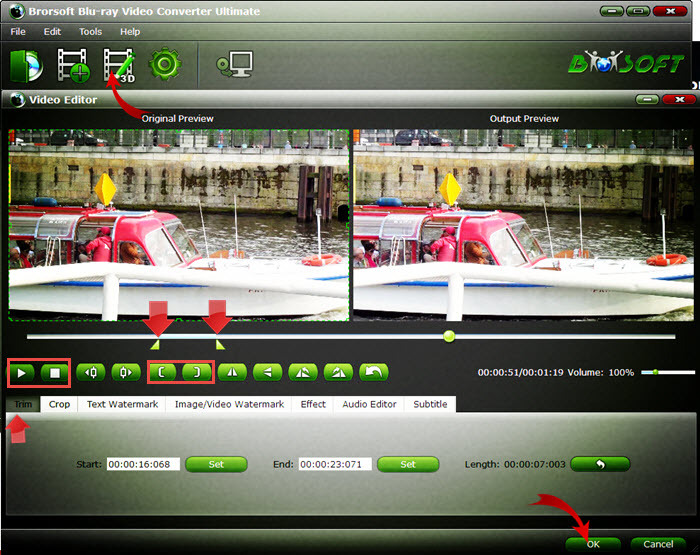 If not, you’ll need to split and cut the video length and convert them to YouTube supported formats as solution 2. As mentioned above, YouTube supports video upload less than 2GB and no longer than 15 minutes, so you’ll need to split and trim the video length in advance. In addition, H.265 HEVC isn’t officially supported by YouTube yet, but some users have successfully processed HEVC encoded video uploads. Thus, split and convert iPhone X 4K to YouTube supported video formats. To finish the task, Brorsoft Video Converter Ultimate is highly recommend to convert iPhone X 4K HEVC/MOV videos to YouTube supported 1080 H.264 MP4 formats without losing quality. Besides, the built-in editor can help you split/trim the video length, crop the black bar, adjust video effect in one place. The equivalent Mac version is Brorsoft iMedia Converter for Mac. Install and launch the best iPhone video converter, simply click Load File to load your iPhone X MOV files to the program. Click Edit button on the main interface, then tap the Trim button. You could set the Start Time and End Timevalues and click OK to trim video length and get the video clip you need for converting. Or, you could directly drag the twin limiters on the player progress bar to trim video length. In the Clip Length, you could see the video length in output files. Tap the “Format” option, and choose H.264 MP4 from Common Video profile list. If you want to keep 1080p resolution as source movie, you can choose HD Video > H.264 HD Video(*.mp4) for YouTube. Tap the Convert button to trim/convert iPhone X videos to YouTube compatible video formats. Afterwards, log in your YouTube account, Proceed and upload the video. Bravo! Your iPhone X videos has been successfully uploaded to YouTube. Useful suggestion, thanks for sharing. It seems my too longer iPhone X shoule be splited into small ones and upload to Youtube for sharing.